One of the easiest things I’ve ever made. Can be made into a 9″ pie or 6 individual ramekin mini-pies. Preparation time: About 10 minutes. Cooking time: 10-15 minutes to cook, plus about 20 minutes to cool to room temperature. If you don’t have a grater (like me), just slice the rind of one lemon as thinly as possible. Boil the water, sugar, juice, and rind for a few minutes. If you have bits of rind because you couldn’t grate it, run it through the strainer to recollect the rind and pour the rest of the mixture back into the pot. Add the corn flour slowly, trying to minimize any clumping. Once the corn flour is blended in, remove from heat and stir in egg yolks. Take the graham crackers or digestives and place in a ziploc bag. Beat the living daylights out of it until you get nice even flour-like crumbs (some slightly larger crumbs are okay). I like to use a large spoon or even a mallot to help me along. Pour the pulverized cookies into a mixing bowl, and add the 1 1/2 tablespoon of sugar in slowly, to taste, so that you sweeten it but not too much. Melt the half stick of butter and pour into the mixture. You’re basically trying to achieve a moistness that will allow you to press the crumbs down into the pan (or mini-pans). It will not become a dough, however. If you are using an aluminum pie pan, you may want to lightly butter the pan before laying down the crumbs. In any case, cover the rim of the crust with aluminum to prevent burning. Take the egg whites and beat until stiff peaks form. Then mix in two teaspoons or so of sugar. If you don’t like merengue, skip this step and store the egg whites for breakfast tomorrow. 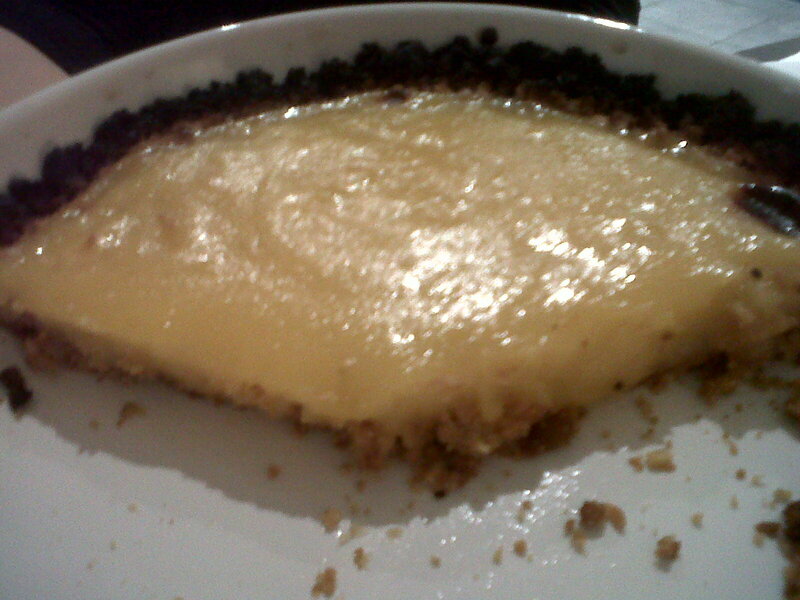 Pour the lemon mixture into the pressed crust. Bake at 450˚F (we did 250˚C, which is 482˚F) for 10-15 minutes or until either the merengue is slightly browned or, if there is no merengue, until the top of the pie filling has formed a skin and gives a little resistance. You can, of course, lower the temperature to say 350˚F (150˚C) and cook a bit longer. The important thing is to keep your eye on the top of the pie. Remove and let cool. If you did not add merengue, you can add whipped cream to the top of the pie, especially if it’s been chilled. However, we enjoyed the pie without anything at all on top. In fact, it was gone by the next day! I love how easy, quick, and minimalist this pie is. I plan on playing with some variations in the near future and will post them!